The first traces of the Hugel family in Alsace can be traced back to the XVth century. Some two centuries later, Hans Ulrich Hugel settled in Riquewihr, which had been devastated by the terrible Thirty Years War. In 1639 he was made a freeman of the city and soon took charge of the very powerful Corporation of Winegrowers. In 1672 his son built a fine house in the Rue des Cordiers, and over the doorway was carved the family crest which was the origin of the company’s logo still used today. During the XVIIIth and XIXth centuries, the Hugel family gained an enviable reputation for their winegrowing skills and for the meticulous way in which they cultivated their vineyards. In 1902, Frédéric Emile Hugel left the old family property and established himself in premises in the centre of Riquewihr which still form the heart of the family business. Vines have been cultivated in Alsace for more than 2,000 years, and brought great prosperity to the region, particularly in the Middle Ages. Thanks to the nearby river Rhine, at that time the most important artery of communications in Europe, the wines of Alsace were exported to Holland, Belgium, Scandinavia and to England, where they were particularly appreciated. Until the early XVIIth century, Alsace was the largest and most renowned wine producing region in the Germanic Holy Roman Empire. The Thirty Years War (1618 - 1648), the French Revolution (1789), the Napoleonic Wars and the Franco-Prussian War of 1870 caused the steady decline of the Alsace wine region. By the early XXth century, the ravages caused by insect pests and by cryptogamic diseases made the situation desperate. After 1918, a handful of farsighted and courageous winegrowers, including Frédéric Emile Hugel, took steps to save the vineyards of Alsace. This veritable pioneer devoted his entire life to the promotion of high-quality wines from noble grape varieties. His son Jean continued this crusade. By his perseverance and hard work he proved that Alsace wines merited a place among the finest wines in the world. His three sons, Georges, Jean and André, have strictly followed this same course, and they have obtained official recognition for Alsace late-harvest "Vendange Tardive" and "Sélection de Grains Nobles" wines. The next generation is faithfully implementing the major principles it has inherited from its ancestors. 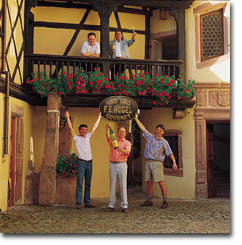 A noble mission awaits Jean-Philippe, Marc and Etienne : to make Alsace wine the great white wine of the XXIst century.